I moved to San Francisco in the fall of 2011 with dreams of meeting a technical co-founder and building the world’s next great startup. Upon arrival, I quickly realized thousands of others had moved here with the exact same idea. We were all looking for that magical technical partner, and finding them meant venturing into their natural habitat: Hackathons! Around this time-period, I was doing anything I could to meet the startup community. My network was non-existent and I was bouncing around to every meetup, conference, or mixer you could think of, trying to build relationships and offer some value to everyone I met. When I found hackathons, I found my home. Here were incredibly smart people, sharing creative ideas and geeking-out over technology, staying up-all-night long telling jokes and drinking beers – and at the same time – quickly building startup ideas and competing for tens of thousands of dollars in prizes. I was hooked! I wasn’t a programmer, but most of my new best friends in San Francisco were coders and we started rolling around to different hackathons together. We all had ideas, we all wanted to create startups, and we used hackathons as a way to validate our ideas if judges thought they were cool. When I created AngelHack, I did it as a way to throw the perfect event that we would all want to go to. AngelHack was just an idea in the beginning. I would tell people I was networking with about this amazing hackathon I was planning and wanted them to attend. But things got serious the day I landed my first sponsor. At the time I was living on credit cards and had to make money any way I could. I was attending a casting call (sigh) and when I told the guy next to me that I was organizing a hackathon he replied, “Oh really, I sponsor hackathons.” Five minutes later, I had my first sponsor! From there I began rallying support from everyone I knew, working day and night reaching out to developers, building sponsor decks, attending networking events, pitching meetup communities, and hunting down sponsors. Most sponsors were at other hackathons, so I would go to every hackathon in town, befriend the organizers and meet all their sponsors. The community was incredibly supportive and loved my passion – and I loved theirs right back. 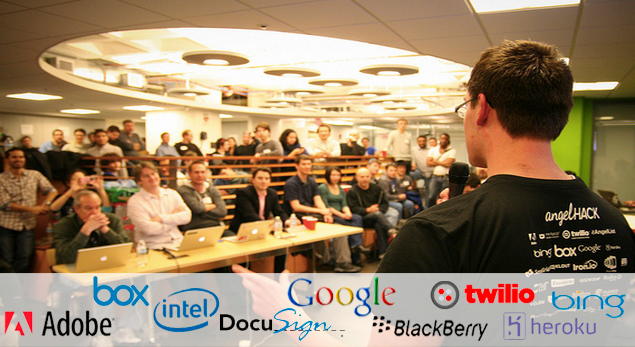 The first AngelHack took place on December 2nd, 2011. 150 people attended, 15 sponsors signed up, a kid named Joey The Cat brought a skee-ball machine, and some of the hacks created moved on to become companies. It was magical and, oddly enough, profitable! The more developers signed up, the more sponsors wanted to be a part of the event. They liked AngelHack so much that they agreed to sign up for my next event too! AngelHack was never supposed to be a business, but it quickly turned into one. I became obsessed with the idea of seeing how big I could make it – could I do this around the world? Around this time, my hackathon mentor, Nick Tomarello, said he would help me expand to Boston. Organizing events in two cities led to incredible organizational challenges, but as with any startup, you learn to build the airplane while you're taking off. Of course, lots of things broke in AngelHack 2: we lost 30% of our sponsors, we were never allowed back into the venues that hosted us and my finals event was a disaster. Any by "disaster" I mean a live virtual pitch competition where Naval Ravikant and Dave McClure almost walked out multiple times. McClure eventually did leave, but only after cussing out one of the teams. It was an epic fail. The volunteer that surpassed my expectations was Sabeen Ali and in another 6 months I would make her my operations co-founder — the perfect ying to my networking yang. Together we scaled AngelHack to 50 cities in less than two years: first across the US, then Europe, and finally South America and Asia. I followed an expansion plan based on what the Startup Genome Project said the best startup cities were. I was systematic in my expansion approach. First, I reached out to my Facebook network for help connecting with startup people in whatever city I wanted to break into. These local contacts would guide me towards the community leaders I should be connecting with and usually provide a couch to surf on when I visited. Then I’d reach out to said community leaders, set up meetings, and personally fly to each city, where I'd build relationships and learn everything I could about their startup community, venues, press channels, top investors, and major players. I was a traveling cheerleader: I’d basically drop in and get everyone excited about hacakthons and having their city compete in AngelHack’s global startup competition. Then 3-5 days later, I’d choose a local ambassador to represent us and leave it up to my team back home to train the ambassador on everything they needed to know. Our local ambassadors became our eyes and ears on the ground, while my team took care of sponsorships, marketing, and branding for the event. We treated our ambassadors like family, checking in on them every week, training them on the ins and outs of hackathons, and assigned them weekly tasks to prep for the big event. This high-touch approach was a key to our success, as it allowed us to see each ambassador’s commitment level and ensure that each event was going to be a huge hit. In 2013, I went all in with AngelHack’s resources towards building a mentorship program called HACKcelerator. Our hackathons were bringing together stellar teams, but 95% of participants failed to raise capital or join accelerator programs afterwards. HACKcelerator was my solution, the piece de resistance to fulfill AngelHack’s mission to help technology entrepreneurs around the world build their startup dreams. I figured the better our startups did, the more positive impact we’d have on the world, and in turn sponsors would appreciate us more. But the big check from sponsors never came and we spent most of 2013 struggling to pay employees on time. Everyone assumed we were killing it because we were growing and had all of these big corporate sponsor logos attached to our name. In actuality, we survived by asking a lot of people to be underpaid, cutting a lot of corners, and being incredibly scrappy – such as zero employee benefits and couch-surfing anytime we had to travel. During this time, many of our best hires moved on to more lucrative jobs, leaving us to hire and train new employees all over again. Our only affordable solution was to work with a lot of green talent and develop them in-house. Thus began a perpetual cycle in the company of growing young talent, having them leave us for better jobs, and then hiring new recruits to fill the gaps. It was like juggling chainsaws. Luckily, some good things happened at the same time. We started to see success with early AngelHack teams. Mark Cuban invested in FashionMetric, Experiment made it into Y-Combinator, and other teams made it into AngelPad, 500 Startups, TechStars, and accelerators around the world. I always knew AngelHack wasn’t my true calling, just a fun thing I could build to help entrepreneurs around the world and help me to network with the industry. After two years building AngelHack all day, every day, I felt it was time to move on and build something new. I had accomplished everything that I had originally set out to do. I had scaled the business around the world. I had found a co-founder and trained her on every aspect of the business. I had built out multiple revenue streams to ensure the company would be financially stable. And I had done it all without ever receiving investment or being indebted to anyone. It seemed like as good a time to go as any. With tears of joy, I emailed my resignation letter to employees and announced December 14th, 2013 would be my last day. It was bittersweet to say the least, but I knew they would continue to crush it. Building AngelHack was like living in a dream. I fulfilled a life-long goal to explore the world. I built dozens of lasting relationships, and, through the collective impact of the startups we helped launch, I felt we contributed something positive to the community. Also, below are a few of my favorite startups whom we helped get recognition and funding.